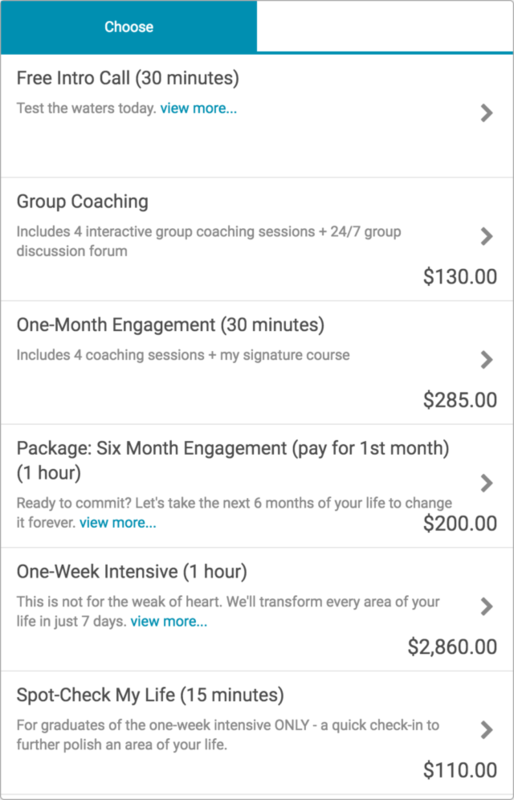 With the advent of our much-anticipated, oft-requested Offerings, you can now sell coaching directly from your own website. Offerings set up a seamless experience for your clients and prospective clients, with options to schedule an Appointment directly into your calendar, be automatically enrolled in a Course (such as an onboarding Course), and/or participate in a Group. One of the great things about Offerings is that they eliminate the need to have a separate account with ScheduleOnce, Acuity, Calendly, or other such online scheduling systems. This is because CA Offerings give you the ability to let prospective clients book intro calls with you directly online. You can have the system automatically send them a coaching intake form or questionnaire prior to that first call. You can have a few Action items pre-loaded as tasks for your new clients to take on as part of getting started with you. You can share select videos or other resources for clients to review as preparation. Essentially, this allows you to give new clients more value up front, and a sneak peak of what it will be like to work with you. They’ll get to experience the results-oriented approach that you offer, and see that you offer real accountability in getting them where they want to go. They can engage with the REAL system that you’ll have for them, and get a sense that, by working with you, they’re buying way more than a package of conversations. These are things that set you apart and make their decision to buy from you easier. Since These Clients Aren’t ‘Real’, Does CoachAccountable Count Them Toward My Subscription Plan? Longer answer: Our goal is to have you deliver better programs, to more people, with less work. The more prospective clients you have coming in, the more paying clients you’ll have (assuming you’re able to close a reasonable percentage of earnest prospects!). And, without a doubt, those who can see the actual coaching management portal you’re using are more likely to pay – they’ve gotten a tangible idea of what your coaching will look like, and they know it ain’t just a notebook and a phone call. Our intent is that the clients you attract via Offerings are every bit as worth adding to your roster as those you add directly. If any of these “potentials” aren’t viable clients, you can, with just a few clicks, deactivate them at any time. This will preserve their data, so that if in a few months they decide to pursue coaching with you, their transition is seamless. These clients only affect your subscription price IF they happen to bump you over your current plan’s limit. Team Edition, we didn’t forget about you! Click on the image to see both versions of the pricing. 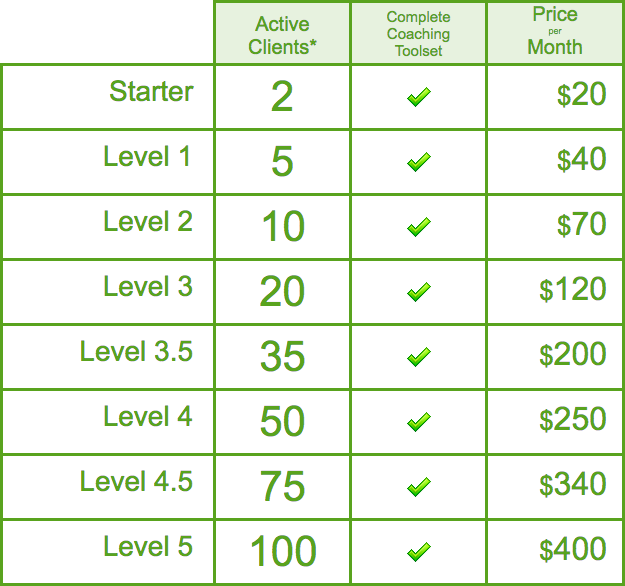 For example, imagine you’re currently at Level 3, which includes 11-20 clients at a flat $120 per month. You have 13 active clients. Then, you book 6 free intro calls with new clients this month: you’re now at 19 clients. Since you’re still inside the 11-20 client range, you’ll still pay $120 this month. On the other hand, if 8 new clients book free intro calls with you, you’ll have a total of 21 clients; this bumps you to level 3.5, and you’ll pay $200 this month. UNLESS, of course, one or more of those intro call clients decide not to pursue coaching; just deactivate their accounts before your billing date, and you’ll be automatically back at Level 3 (11-20 clients). Why Do Potential Clients Count? And, you’ve just used a powerful and personal marketing tool by showing them the detailed innerworkings of your coaching process. Know your CoachAccountable billing date. Not sure when it is? Click on your name in the upper right, then go to My Account >> Invoices. Do any housecleaning the day before. If your billing date is the 15th, do a sweep of your account on the 14th and deactivate any prospective clients who aren’t yet moved forward with coaching. Takes just a few clicks and you can reactivate them whenever. Develop a robust Offering. Oftentimes, the more interaction a client has with CoachAccountable, the more likely they are to be a paying client (and one with remarkable results). Utilize your Offering to its fullest; maybe you choose to automatically add clients into a Course that gets them really thinking about your content. You can design the Course however you like. It can assign a quick Worksheet or two, drip some relevant articles that you normally share via your blog or CRM (a la InfusionSoft or the like), or show off your personality with a few heartfelt messages. At the end of the day, Offerings allow you not only to let your would-be clients book with you, but also to show off what sort of experience they’re really going to have working with you. That they are full-fledged clients within your account is ultimately a good thing. Take advantage of that fact by really wowing them before you even get on the phone, and you might find them hungry and eager to work with you before you can even say hello on your intro call. Ready to give the leads in your pipeline the true experience of your coaching? Start your free trial of CoachAccountable today, and set up an Offering in just a couple minutes. More recently: Have a Bunch of New Clients? Bulk Import Them. I totally agree how you nailed this!